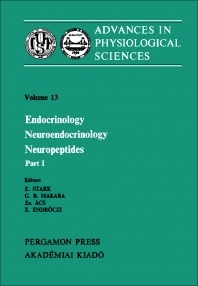 Advances in Physiological Sciences, Volume 13: Endocrinology, Neuroendocrinology, Neuropeptides, Part I offers a lengthy discussion of the research, experiments, and investigations on endocrinology, neuroendocrinology, and neuropeptides. This selection, divided into five parts with 47 chapters, features the literature of able scholars who diligently conducted research on the subjects. The areas covered in their literature include discussions on hormone receptors and decoding of genetic information; biosynthesis, processing, and characterization of prehormones, prohormones, and hormones; pituitary and gastrointestinal hormone-like material in brain; behavior and hormonal balance; and extrahypothalamic structures in neuroendocrine regulation. Although the contributors put their efforts on different areas, they clearly present how endocrinology, neuroendocrinology, and neuropeptides caught the interest of physiologists and scholars. In clarifying their works, they include in this book observations, methodologies, conclusion, and recommendations. This book can best serve the interest of physiologists and other readers interested in the research on endocrinology, neuropeptides, and neuroendocrinology.